Finding myself back in Chinatown at lunch again today (on my way to visit Dave again), I stopped into Backspace to check it out. Backspace is pretty much what one envisions when they think of a coffee shop in Portland. I could easily see a sketch from Portlandia set here. It's part performing arts venue, part coffee shop, part Internet cafe. Backspace touts themselves as "Portland's premier music venue for all ages shows." To be honest, Portland is a city very much in love with it's alcohol, so 99% of the music venues also happen to be bars, so I guess, by default Backspace might be the premier venue for all ages shows, since I really can't think of any other intimate venue to see an all ages show that isn't in a bar. Backspace also has a LAN party room in the back, so if you're into group gaming, you might want to check them out. There wasn't any music happening when I popped in, which was fine by me, I prefer to eat my lunch in peace when I'm in a hurry. I don't even know what "they're dank" means when referring to edible items. My dictionary tells me that dank means disagreeably damp, musty, and typically cold. SICK. 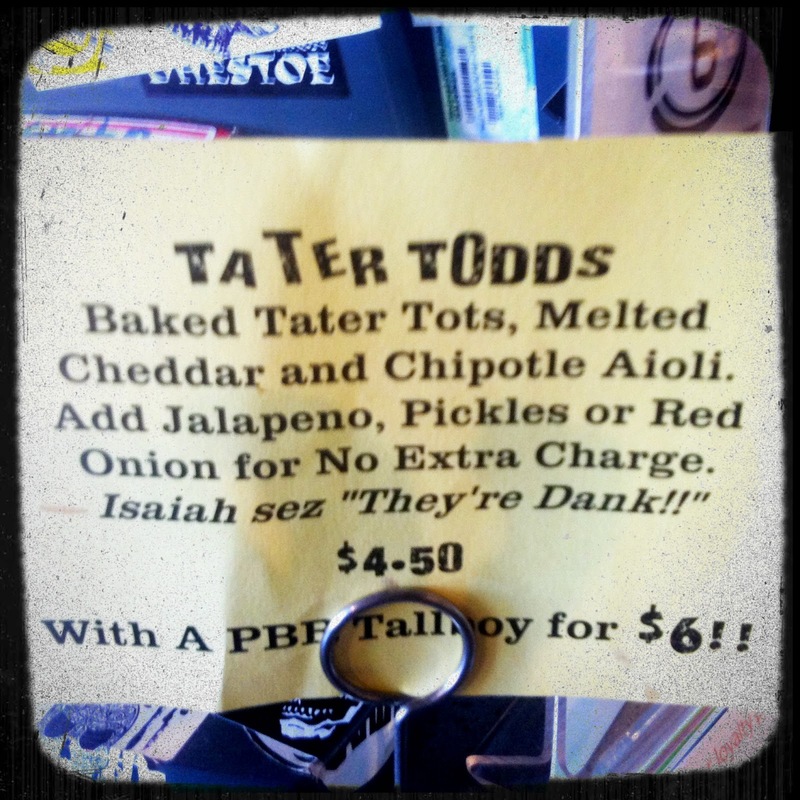 But, figuring I'm just not up on the slang used by kids these days, I decided to order the Tater Todds. 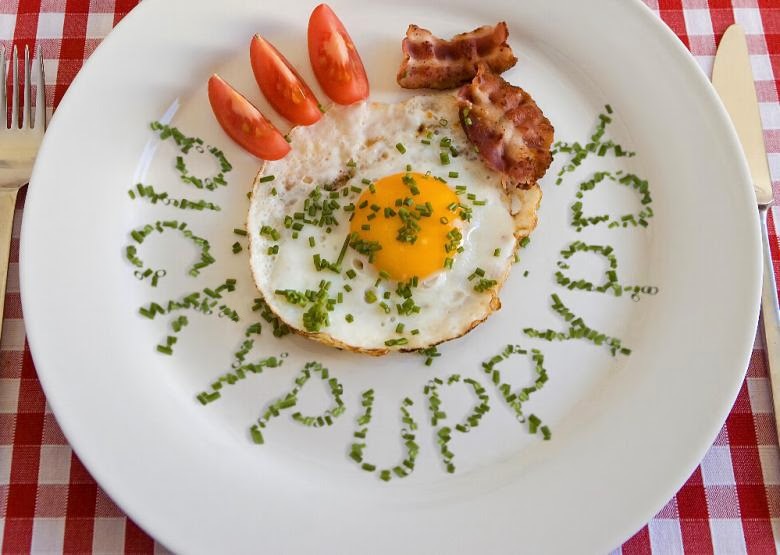 I added jalapeno and pickles to my order as well. I grabbed a number and claimed a table between a guy working on his laptop, and a group of people playing Magic the Gathering - I'm as shocked as you are that a) people still play that game, and b) they were doing it in public. Unfortunately a couple moments after sitting down, someone from the kitchen came out to tell me that they were out of pickles so my tater todds would be lacking my favorite condiment. I thought it was great that they came out to let me know before they brought my food, but if I hadn't been okay with it, there wasn't much that could have been done. I'd already paid at that point, it would have been quite a hassle to figure out the difference in prices if I'd decided to order something else instead. 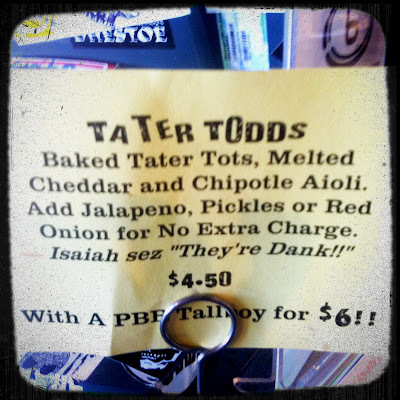 While waiting for the tater todds to arrive I started to regret my decision to order them. I began to envision a bowl of grease being delivered to my table. When they arrived I was pleasantly surprised. To my delight the tater todds were dry (in a good way). There was just a light sprinkling of cheese (not the horrible greasy mess I was imagining), and the perfect amount of aoili. 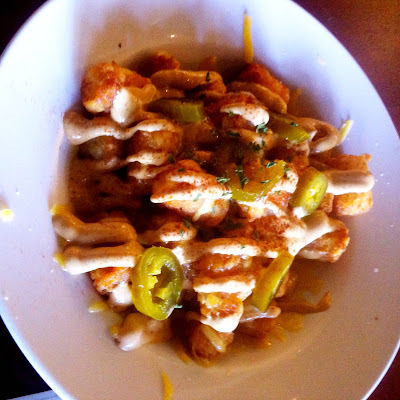 The jalapenos added just the right bit of extra flavor to the dish. I'm unsure if the pickles would have made the todds better, or awful - it could really go either way, so I suppose I'll just be thankful that they were out of pickles. Something I found very interesting is that it is impossible to get a couple of shots of espresso over ice at Backspace. They serve Stumptown Coffee, and apparently Stumptown prohibits them from serving their espresso over ice. Or at least that's the story they're telling at Backspace. I'd definitely return for a proper lunch, but probably not for music/poetry readings/whatever else goes on here. It didn't seem like my taste in music fit well with the vibe in Backspace. If you'd like to check out Backspace for yourself, they're located in Old Town at 115 NW 5th Avenue in Portland and are open from 7:00am - midnight Monday - Friday, and 10:00am - midnight Saturday and Sunday.